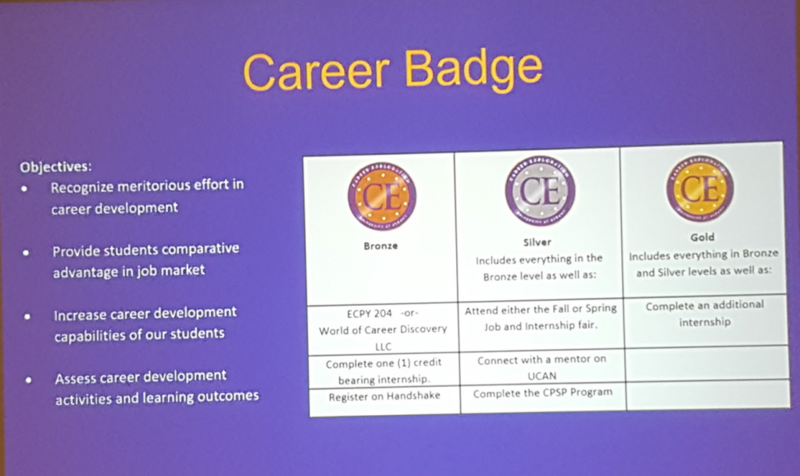 The University of Albany team of Trudi Jacobson, Kelsey O’Brien, Doug Sweet, and Mary Ellen Mallia gave a highly informative presentation on how they are using digital badging to support academic and student affairs initiatives. Presently, they have 70 different involvement markers. They began the presentation by defining what a digital badge is and how it could be used to recognize formal classroom activities, work skills, and individual knowledge. They are using it for pathways to success. More information can be found on their get involved page. When building badges, they focused on developing the criteria for the badge as well as making the badge look good. After building the badge, they initially began by awarding badges retroactively to students who had already met the criteria. Career badge – Recognition for advancement in career development. They are also issuing badges for student leadership training, leadership roles, etc. 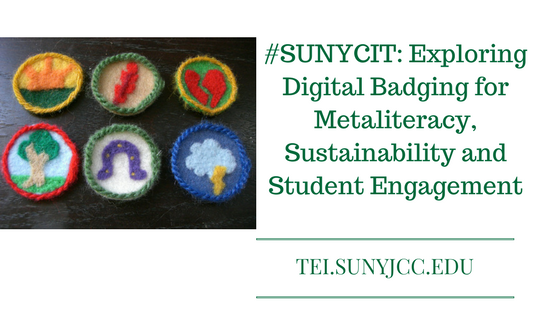 Students can earn different badges for meritorious effort in sustainability. These badges are based on knowledge, experience, and co-curricular activity in sustainability. Some of the criteria include attaining a B+ or better grade in two or more sustainability-focused courses. Attending major campus events also count towards the badge. To earn a badge, students apply for the badge. Individual offices will review the submission to ensure all criteria has been met. Once earned, students have the choice to share the badge with others. FERPA rules do apply. The framework is based on the book, Metaliteracy in Practice. Most of the quests are based on reflective exercises that the library team reviews. Additionally, these quests or activities can be used within academic classes for a grade or extra credit. Instructors can choose activities to use and localize them to the specific class. Librarians work with the interested instructor. Each quest has an introduction followed by a video. The quest also includes the actual assignment criteria. In one class, 35% of the grade was based on digital badging activities. The University of Albany is working on developing a set of digital badging constellations around augmented reality as well as improved health literacy skills. This was a very informative presentation. I was fascinated with the number of badges already created and the diversity of the badges. If you want to learn more about this presentation, please drop by the TEI Synergy Center.